This week at the ISTE (International Society for Technology in Education) conference in San Antonio, TX, 3D printer company MakerBot launched a new cloud-based platform for educators, My MakerBot, and the MakerBot Educators Guidebook. Compatible with Chromebooks, My MakerBot is designed to make it easier for students to use printers and for instructors to manage them. 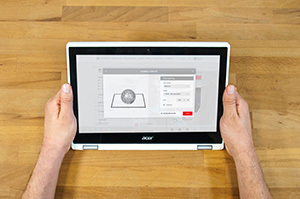 The platform connects a user's networked 3D printers, Thingiverse account, orders and support cases and allows users to upload and prepare files, print and monitor print jobs from any device. My MakerBot will also allow users to import designs from Autodesk's design tool for K–12, Tinkercad. The new guidebook is designed to support educators as they begin to use 3D printers in their classrooms. "Featuring a crash course in 3D design and printing, as well as nine classroom-ready 3D printing lesson plans, the new MakerBot Educators Guidebook is the definitive how-to on 3D printing in the classroom," according to information released by the company. "We wrote the guidebook in collaboration with over 80 MakerBot educators, all dedicated leaders in STEM education, in order to deliver the ultimate resource for learning the basics, best practices and for finding high-quality lesson plans." Each project in the book offers step-by-step instructions, information about standards alignment and author notes to help guide teachers. Nearly 300 additional lesson plans are also available at the Thingiverse Education site. More information is available at makerbot.com. Visit MakerBot in booth 600 this week during ISTE 2017.